Theme is a term thrown around a lot in screenwriting and storytelling but what do we mean by ‘theme’? Does your script need one and if so, how do you discover what the theme of your story is and dramatize it? Your story’s theme is what your story is really about. If someone asks what your film’s about, you might tell them the logline, which is probably a very short summary of the plot. It’s A Wonderful Life is about a suicidal businessman who is visited by an angel and shown what the world would have been like if he hadn’t existed. But what is the meaning of that plot? What truth about the human condition does it reveal to us? What does it have to say? For It’s A Wonderful Life we might feel that the message of the film is that a life well-lived has significance and meaning; no man is a failure who has friends. The theme is your point of view that you wish to express about a specific aspect of a specific subject, whether it’s love, money, greed. When Harry Met Sally isn’t just about ‘love’ but the question of whether men and women can be just friends. Theme is often referred to as the moral message of the story. The Wizard of Oz isn’t just a fun adventure story about a girl who visits the magical land of Oz. It uses that plot to say something about the human condition, to ask questions about whether the grass is greener on the other side of the fence (or in this case, over the rainbow) or whether, instead, there’s no place like home. Some people argue that your script (especially in some genres) doesn’t need to have a theme. And certainly there are plenty of examples of highly successful films which are very entertaining but have nothing to say. But rather than think, why should I, surely the question is, why wouldn’t you? Human beings are hard-wired to create meaning from what we perceive with our senses. Since your audience will try to find a meaning from your story anyway, why not consciously craft one and use your story to say something about the world or about the human condition? It’s this innate desire to find meaning in events and actions that means that a script which has a theme and something to say is a more satisfying read than one that does not. And if you’re writing on spec the first job of your script is to move the reader to action. Your script may have an interesting premise or compelling characters but if it’s not ‘about’ anything, if there isn’t a deeper meaning, it can lead to a pass. A script with something to say is much more likely to get your writing noticed. At the recent National Writers’ Conference the panel on writing for film and tv, including Rachel Williams of BBC Writersroom, all agreed that writing what you want to say was more likely to get your noticed than writing what you thought the industry was looking for. A script with a strong theme, with something to say, not only gets you attention as an exciting new writing talent, but it also delivers what both commissioners and managers are looking for from a script. Amazon Studios’ Head of International Productions, Morgan Wandell, was explicit when discussing their commissioning interests at the C21 Drama Summit last year. An entertaining genre piece isn’t enough anymore. What they are looking for is “genre projects with something to say”. Theme not only gives a story a deeper meaning but it also tends to give actors something to get their teeth into. And the number one thing managers look for in a screenplay that they can sell is ‘actor bait’. Rounding up the seven things agents want to see in a screenplay, experienced studio executive Stephanie Palmer said “your script needs one terrific role for a movie star”. How do you find out what your theme is and how do you express it? If you’ve created your story as a way of expressing what you wanted to say, then you’ve already nailed your theme. But what if instead you’ve come up with a cracking ‘what if’ premise with some entertaining plot twists and have no idea what the story’s ‘deeper meaning’ might be? You might use journaling to explore your thoughts and ideas about the world, about human nature. Discover what you want to say by writing in a stream of consciousness about anything that moves you; makes you sad or angry or joyful. Then see if any of those subjects and thoughts are already emerging in your characters or story. Alternatively, dig deeper into the story and, in particular, your character’s main flaw. While their conscious want or desire will drive the plot, it is their need to grow and overcome their flaws that will inform and dramatize your theme. Why do they act as they do? What motivates them? What troubles them? How are they being changed by your plot? How are they growing? Your story’s theme is often expressed through its protagonist’s internal transformation. What lesson does your character learn? 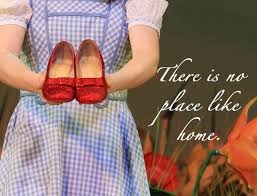 In The Wizard of Oz the theme can be expressed as a strong, simple statement, the lesson that Dorothy learns; “there’s no place like home”. There’s a fine line between having something to say and preaching at your audience. How do you find your balance? To avoid making your script feel too heavy-handed or polemical, try expressing your theme as a moral question rather than statement. For example, rather than ‘money can’t buy you happiness’ you might instead have your script ask ‘can money buy you happiness?’. This might feel like a very small, subtle shift in your thinking but it can have a dramatic effect on the choices you make in the writing. Think of your theme as a tug of war between two opposing points of view on the same subject. The best way to dramatize this is to give your main characters opposing views. In Wall Street the question posed is “is greed good?”. Gekko believes that it absolutely is. Bud’s father Carl thinks it isn’t. Bud himself will start the story believing one thing and end it thinking another. Whether you know what you want to say from the outset, or tease out your theme as you develop your project, a script with a clear theme, with something to say, will help it stand out from the crowd.